The #1 New York Times bestseller featuring the Atkins Nutritional Approach™— a celebrity-favorite diet perfect for losing weight before your wedding or to bounce back into shape post-baby, or if you just want to look and feel your best—includes delicious new menus and simple recipes, a free carb counter, and new tips for weight loss. Millions of people have already discovered how to get healthy, lose weight, and keep it off—and now you can too! The Atkins Nutritional Approach™ is the proven weight loss program that enables you to enjoy the foods you love on the road to good health, increased energy, and a greater sense of well-being. With Dr. Atkins' New Diet Revolution you get everything you need: essential medical and nutritional information, a helpful carbohydrate gram counter, low-carb meal plans, and dozens of mouth-watering recipes for everything from appetizers to entrees to desserts. Start your new life today; become a healthier, fitter, happier you. It all begins with Atkins! Robert C. Atkins, M.D., was the founder and Executive Medical Director of The Atkins Center for Complementary Medicine in New York City. His groundbreaking weight loss book, Diet Revolution, was the first major work to prescribe a low-carbohydrate diet. 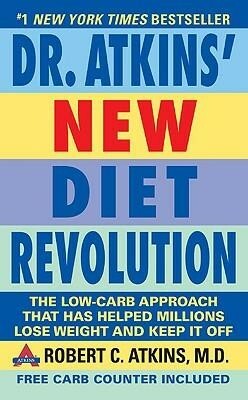 The revised and updated Dr. Atkins' New Diet Revolution spent more than six years on the New York Times bestseller list. I'm the author/artist and I want to review Dr. Atkins' New Diet Revolution: Completely Updated!Updated Edition.